Five Common Responses Dental Staff Members Typically Use On The Phones That Actually Drive New Patients Away! Every day in every Dental Office the phone rings with a New Patient Enquiry Call. And our staff are driving those enquiries away…. The phone rings and it is someone wanting to book in with us, and our receptionist is turning the caller off, and turning them away. Putting it simply, our receptionist is not thinking out the call. In this day and age, in 2015 and into 2016, we have to realise that when that phone rings out there with a new patient enquiry call, the caller has already done their homework on us and our practice and has already decided that we are the Dental Office for them. The reason for this is because with the internet, with Google and with Facebook and with YouTube, the caller has all the resources they need to make an educated decision already right at their fingertips. And so the physical act of phoning our office is simply their way of confirming that decision, and it’s only up to us and our team to mess it up and prove to them that they have indeed made an incorrect decision. And sometimes that’s what we do. Sometimes, “sometimes” is putting it politely. Statistics will tell you that only twenty percent of all New Patient Enquiry phone calls are converted to physical appointments. Yes, you’ve read it here perfectly. Four out of every five new patient enquiry calls to a Dental Office fail to result in an appointment. And the reason for that is that simply our Dental Front Office person is failing to realise how easy it is for them to create the desired outcome. With that in mind, here are Five Common Responses staff members typically use on the phones that actually drive new patients away! They fail to set the tone for the call, for answering the call, by not getting themselves into the ideal physical state to achieve the best result. And we achieve the best results when we are wearing a smile on our face and not a frown. When the phone rings they need to be mentally *with* the call. They need to be “in the zone” to best receive the call and the best way of doing that is by feeling connected with the phone and feeling connected to the end result that is desired. And that result is that we need an appointment to be made. And we can only achieve our best outcomes when we are happy to be doing what we are doing. Everybody loves the sound of their own name, and hearing somebody regularly use our name draws us to that person. Using somebody’s name creates a bridge. Failing to use a person’s name creates an unnecessary distance between two people. I have a Dental Problem. Are you able to help me? The reason our callers lead with either of these two questions is simply, that they do not know what else to start with. Nobody calls a Dental Office for fun. This is not a pastime that women do on a Monday afternoon after tennis. When the phone rings, with an insurance or price enquiry, it is not somebody doing market research. It is indeed a person in need, with a Dental issue, seeking a solution to their problem. And it is our job to be the solution to their problem. This is a light bulb moment. The day that our person answering the phone realises this watershed moment is the day that our New Patient numbers begin exploding. Putting it simply, they fail to listen to what the caller is saying, both directly and indirectly. They think that when the phone rings, it is an opportunity to show someone new that they are indeed a very knowledgeable person. When in fact, what they really need to be doing is showing the caller that they are indeed a helpful person. We always need to be listening more than we talk. This is why the good Lord gave us two ears and only one mouth. It is only while we are listening that we can truly become a problem solver. Remember, they haven’t called for a pizza, as Jayne Bandy would say. The reason they have called is that they have a dental issue and they believe we are the best office in town to solve that issue for them. If we fail to secure an appointment for them by failing to ask for the appointment we have let the caller down and we have let our Office down and our team down and our Doctor down. “If you don’t ask you don’t get” is what I used to say in my dating days, and it is just as applicable here in this situation. By regularly asking feedback loop questions we are able to confirm that we are indeed helping our caller. If we do not regularly check in with the caller we drift across into lecturing and away from our primary goal which is to help solve their problem by organizing a time for them to come to our office to see the Dentist. Remember the person asking the questions in the conversation controls the conversation. Feedback loop questions such as “Does that make sense?” and “Don’t you agree” also help to create a *YES Momentum* within the conversation that helps move the caller towards the desired end result. And that result is an appointment at our Dental Office with our wonderful Dentist. If we fail to secure an appointment time for the caller we have let that caller down. Because frankly, we know it, that we are indeed the best Dental Office in town. And now that caller will be going elsewhere. All because we failed to do what we were meant to do. How’s Your Dental Business Brain? I’m often reminded that owning a business is not an act of charity. There’s blood, sweat, and tears involved a lot of the times. Yet some people think that owning a business is like, a license to print money. Some people go into business because they think it’s a way of not having to answer to their boss. Because they don’t like their boss, and they don’t like the fact that all of the money that they earn for the boss’s business does not come back to them. Which is kind of crazy because the business is actually supporting the employee. So when these employees go out on their own, they’re sometimes in for a little bit of a shock as to the reality of what owning a business is truly like. Have you ever heard this said? Because sometimes, it’s the truth. Sometimes, after all the hard work is said and done, the dividend from that hard work involved in owning the business could well have been achieved by simply focusing a little more on something small. I hear of Dentists who open up a second office that turns a profit of say, fifty thousand dollars a year. Which on it’s own is quite good. Imagine having a stand alone machine that spits out $50,000.00 each year, on its own? But $50K is one thousand dollars per week, which is really two hundred dollars per day…..
Is there some little tweak they could have performed in their core business to create the same return, without the risk and capital outlay, and without the headaches, and without the ulcers and drama? Sooner or later there is a need for McDonalds to build more outlets. But it’s not just two. And it’s not just ten. In dentistry, is the leverage gained from being a business owner, or multiple site owner, worth all the extra angst? I once employed a new graduate dentist for a twelve-month period. Every week we’d meet for an hour to go over her cases, and I’d mentor her. There’s a lot to be said for looking at the acres of diamonds under your nose before trying to build an empire. I’ve heard reps say that Dr. So and So is always busy when they call there. But seeing lots of patients does not always mean being profitable. Having a waiting room full of people who are there on insurance only may not be as good for the bottom line as having one or two patients having good old quadrant dentistry being performed. Or one cosmetic case per day. There’s smoke and mirrors and there’s smoke and mirrors. One of my clients has turned a two room Dental Office from collections of $700K p.a. into a nearly two million dollar a year practice, in a quiet suburban street location, in less than two years. With a few minor tweaks, she’s almost tripled her collections in an eighteen-month period, by tweaking her lot rather than expanding her empire. All done working only four days per week. A very nice “under the radar” style operation. Looking from the outside doesn’t really tell the true story. But the bank account tells the story. It’s The Service, And Not The Dentistry, That Keeps Them Coming Back…. Some of you know that I have two homes. We have a family home in Sydney, as well as a sixty-eight acre farm, or ranch, two hours drive south west of Sydney, where we raise beef cattle. The farm is located in a small village, which has a pub, a butcher shop, and a café. And a school, and that’s about it. It’s a really lovely part of the world. Recently the residents of the village and surrounds have been excitedly awaiting the re-opening of the café, which has changed hands in ownership. The café has been closed for business for several months as the new owners remodeled the interior to create something new out of of a very quaint old building. So it was with anticipation that my wife and I booked a table there for lunch last weekend. After all, we can walk to lunch there, and enjoy our food, and then walk home. In anticipation of our meal, I thought it might be a good idea to review their dishes on their menu on their website. Just a splash page, letting me know that the website was coming soon. Now you’d think, in anticipation of opening your doors for business [it had been several months], that getting a menu online would really have been a simple priority? Sadly, no. It seems that the cart came before the horse in this instance. And isn’t it like that in dentistry some time? There are Dental Offices out there, in 2015, with zero or little web presence online to inform and entice potential and existing clients with information and graphics about their services and the people who work in those businesses. And of course, when choosing a dentist, the public believe that Dental Offices with no web presence have something to hide, or are behind the times. And so they let their fingers do the walking…. I know when I’m in a foreign city looking for somewhere to eat I always go online to review menu choices before making a booking. But this was our local. So, the renovations to the interior were pleasant. When we arrived for our booking, all tables were occupied, except for the table reserved for us. In only it’s third week of business, it seemed that the café has been a success waiting to happen. In fact, the owner was pleasantly surprised with the activity of the day. And as I mentioned to her, the opposite, of NOT being busy, really is something to complain about. So we were seated for lunch, with our menus, and the instruction that when we were ready to order we were to go to the counter to place our orders, and then the food and beverages would be brought out to us to our table. Obviously with opening up a new café, this process allowed the owners to gauge the number of staff needed. However, the system fell down when our three dishes ordered, our shared starter plate, and our two individual main meals, all arrived together. Our waitress explained that when the order reached the kitchen it was then all prepared at once. There was no staggering of dishes. So if we were to dine there again, we would need to approach the counter and order our meals in stages, one serving at a time, to ensure this scenario did not happen again. Or simply, to me, it wouldn’t take much grey matter to create a system, like they have in every other restaurant in the world, to logically stagger the dishes for the diners. In business, sometimes the basic systems need to be in place as our *Always and Nevers* to ensure that we don’t disappoint our customers with our lack of “givens”. And to me, staggering three dishes for two diners was a given. And given, that it’s early days for these new owners, there’s a feeling from our hearts that overwhelm for them is a good thing. But some things need to be in place from the get-go. And staggering those dishes would be one of those things. In Dentistry, we always have to inspire our clients and patients that we are in control, and we do know what we are doing. So we need to have our systems and procedures role played so that we don’t come across looking like brazen amateurs. Now back at the café, if we wanted a second glass with our meals, it was up to us to approach the counter and order another. Which kind of takes away from “the moment” of the meal, if you know what I mean. And it certainly will result in fewer sales of beverages, than if there was a waitress monitoring and observing whether “the glass was half full”. Finally, we noted, that the pace of clearing tables also needed some attention. Nobody likes to sit looking at dirty dishes on their table for extended periods of time. So here again, is another Always and Never that needs to be emphasised. And in so clearing the table, of course the wait staff has the opportunity to offer cakes, desserts and coffee. Now that would make sense. At your Dental Office do you have your basic systems in place? Are your poor systems and lack of systems working against your core business? If you think that the quality of your dentistry is going to keep people streaming in your door despite your lack of attention to detail in service, then let me tell you, you’re in for one heck of a rude shock. If your customers are not *raving* about the way your people at your office look after them as customers then your Dentistry is just purely a commodity, and your patients are only temporary. If your people are not schmoozing your patients and loving them to death then sooner or later those patients will take their dental business elsewhere to a Dental Office that treats them like a valued friend, and not just a number. So back to the café. Did I mention that the oysters were fresh and sweet, and the sashimi plate was heavenly? Or the beer was icy cold? I only wrote about the service defects. The food might bring me back…. But the service will keep me coming back…. It’s Your Show. You Make The Rules. The wonderful thing about being a Dentist and owning a Dental Office in the western world is that you are pretty well able to create the practice that you want wherever you want. Now there’s a bold statement. Now let’s think “businesses” for a minute…. Have you ever noticed that there are some businesses that do well despite adverse economic and market difficulties? 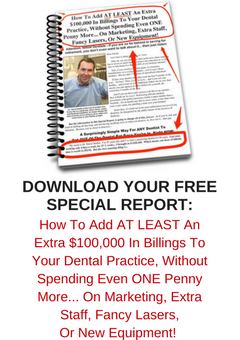 Why should your Dental Office be any different? People will always have teeth. People will always eat poorly. There will always be people with poor oral hygiene. There will always be people with money. Have you ever noticed during tough times and in tough locations there are always luxury car dealerships? They don’t seem to have difficulties? And you never read about the Ritz-Carlton ore the Four Seasons having to close down their Hotels because their regular guests are now staying at Motel 6 instead? I heard recently that twenty to twenty-five percent of consumers out there do not care about what you or your competitors charge because they consider your fee for whatever you do [be it dentistry or otherwise] as being exceptionally good value. Do you really care what your hairdresser charges for a cut, shampoo and blow dry? When you go to your favourite restaurant, do you sit there adding up the prices of the components of your meal before you order, or do you simply “sign for it” at the end? And that’s how dentistry can be too. And I know it because I built a Dental Practice just like that, based on those principles, in a *VERY* working class part of Sydney. But even through difficult economic times in my town, there was a BMW dealership and a Porsche dealership that never seemed to waiver. Because they focused their business on looking after the customers who wanted their product. And not trying to be all things to all people. Because trying to please all people is a way of pleasing very few. And with nearly one quarter of your surrounding population out there being happy to pay your fees that you determine no matter what, provided you deliver a great service and product, then why would you *NOT* be trying to always be marketing to and attracting those kind of patients. Because they are out there. None of these people want to loose their teeth any sooner than they have to. None of these people want to have a smile that is ugly. None of these people will choose a breath that would knock the petals off a flower at fifteen feet. But if you don’t build it, you will be just like every other dentist out there. You’ll simply be a commodity. And consumers choose commodities on not much else than price. And that’s a difficult market. If there’s one topic that draws more discussion in Dentistry than any other it’s templating, or pre-blocking your appointment book. If you want a more successful practice than average, then templating is what is needed. But if you prefer the randomness and unpredictability that no-template provides, then just keep doing that. The thing that templating provides to your team, to you, and to your patients is structure. And with structure comes service. So it follows that without structure it is impossible to provide a World Class Customer Service experience to your patients. As customers ourselves, it frustrates us. Who likes lining up at a grocery store, at a post office and being behind one, or several customers with no idea of what they are doing who are being served by someone with not much more idea or structure? It’s a waste of your valuable time. Have you ever noticed that some retail businesses seem to be poorly staffed at busy times? How do you feel as a customer when it seems that the business hasn’t really seemed to plan a service factor into their day? Jamming one appointment on top of another and on top of another without regard to what type of appointment best goes where and what type of day we are creating is simply a slap in the face for our team, our doctors and our patients. Imagine doing a nice cosmetic case on a patient only for that lady to check out of your office at the same time as the six Murphy children are climbing the walls in your reception area while their mother is having the family’s first hygiene visit for the afternoon? Maybe that could have been avoided by better planning? Or you finally get the isolation and rubber dam in place on a molar endo you’re about to begin, and your hygienist “buzzes” you for a detailed examination down in her room? How’s the endo patient going to chat and visit with your DA while he’s got that contraption stuck on his tooth? Templating or pre-blocking allows you to create grace in your office rather than hysteria and pandemonium. By knowing your production and procedure numbers from last year, you can simply plan out this year to have smooth days rather than peaks and valleys. And that has to be more predictable for your patients, for your doctor and for your team. Knowing that last year you performed 850 hours of restorative composites you can plan that on average, this year you are going to need to average about four and a half hours of restoration time per day. Knowing that last year you billed four hundred and fifty crowns for the year means that on average, you should pre-block nine crown appointments per week, or three days of two crowns and one day of three crowns. And where would you like to see those appointments? Straight after lunch on one day? First thing in the morning on Tuesdays? For the team for the patients, for you. Two thirds of patients in regular hygiene are coming four times per year. Knowing this allows our scheduler to plan the non-examination visits alongside the restorative appointments for the doctor where he needs to be one hundred percent there. A templated appointment book is simply about structure and organisation. The whole of your life is structured, isn’t it? Why would your valuable time at the office not be as orderly?